The Bookshelves: New to Shelves (#54) - Finally a Book Haul! New To Shelves is a way to share all the great books I got this whole week and to add to my TBR Pile! It also includes a roundup of what's going to happen next week on the blog. It's a new name but similar meme. I'm finally back with my New to Shelves! It's been such a long time since I've done this and I cannot wait to share with you what I have! The book below are ones I currently got, rented, or for review. It's The Silver Shadows trivia! If you are a reader on my blog and on Jen's you would notice we always do one every time Richelle Mead releases a new Bloodlines novel, and I'm so pumped for this!! 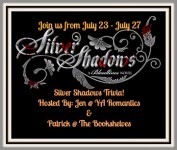 The Silver Shadows Trivia will be from July 23 - July 27 and you might win a copy of Silver Shadows! Also! If you looking for a blog button for a giveaway, meme, or anything I can be at service! It is currently free at the moment and feel free to shoot me an email! Happy Reading! Be sure to leave your link, I'll be sure to hope by! I would like to try one of those books in Kara Taylor's series! x) I see them around but have never really tried one. I hope you like Side Effects! I was a little underwhelmed after the initial hype but it was interesting. My Stacking the Shelves! I've very curious about Side Affects, but I've not heard of the other books. Great haul Patrick and thanks for stopping by My Haul!